On the day of interview, eligible Candidates are required to submit attested photocopies of relevant documents & passport size photograph along with application form which may be downloaded from the Vidyalaya website www.kv1gandhinagar.org, No TA/DA will be paid for attending the interview. Details regarding eligibility, minimum qualifications, remuneration are given below. Established in December 1971, KV No. 1 is situated in Sector 30 in Capital city of Gandhinagar, in sprawling area of 15 acres. It firmly believes in the ethos of The world is one family as it fulfills the educational needs of wide cross section of students especially the wards of defence personnel, paramilitary forces and transferable center govt employees. Competently maneuvered by the Principal, with an active support group of VMC, PTA and highly committed staff of 59 members, the school is marching towards excellence. The present strength of students is 1393. 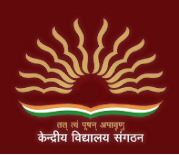 Kendriya Vidyalaya, Gandhinagar has published Advertisement for below mentioned Posts 2017. Other details like age limit, educational qualification, selection process, application fee and how to apply are given below. d) For TGT (SO.St) Any two of the following: History, Geography, Economics and Pol. Science of which one must be either History or Geography. PGT (English)- EnglishPGT (Hindi) – Hindi or Sanskrit with Hindi as one of the subjects at Graduate level.PGT (Maths) Mathematics/ Applied MathematicsPGT (Physics)–Physics / Electronics/Applied Physics/ Nuclear Physics.PGT (Chemistry) Chemistry/ Bio. Chem.PGT (Biology) - Botany/ Zoology/ Life Sciences/Bio Sciences/Genetics/ Micro Biology/Bio Technology/ Molecular Bio/Plant Physiology provided they have studied Botany and Zoology at Graduation level.PGT (History) – HistoryPGT Geography-GeographyPGT (Commerce) – Master’s Degree in Commerce. However, holder of Degrees of M.Com in Applied/Business Economics shall not be eligible.PGT (Economics) – Economics/ Applied Economics/ Business Economics.PGT (Pol.Science) B.Ed. or equivalent degree from recognized university Proficiency in teaching in Hindi and English media. At-least 50 % marks in aggregate in any of the following; B.E or B. Tech. (Computer Science/IT) from a recognized University or equivalent Degree or Diploma from an institution/ university recognized by the Govt. of India. OR B.E or B. Tech. (any stream) and Post Graduate Diploma in Computers from recognized University. OR M.Sc. (Computer Science)/ MCA or Equivalent from a recognized University. ORB.Sc. (Computer Science) / BCA or Equivalent and Post Graduate degree in subject from a recognized University. OR Post Graduate Diploma in Computer andPost Graduate degree in any subject from recognized University. OR ‘B’ Level from DOEACC and Post Graduate degree in any subject. OR ‘C’ Level from ‘DOEACC’ Ministry of Information and Communication Technology and Graduation. B.E /B Tech (Computer Science) / B C A / M C A / M. Sc (Computer Science) / M.Sc. (Electronics with Computer Science component) / M.Sc(IT) / B.Sc. (Computer Science) OR Bachelor’s/ Master Degree in any Science subject/ Mathematics from recognized university with Postgraduate Diploma in Computer application from government recognized university/ institute. OR Post-graduate degree in any subject with Postgraduate Diploma in Computer application from government recognized university / ‘O’ level from DOEACC. OR Post-graduate degree in any subject with minimum ‘A’ level from DOEACCCoaches for Athletics (Track events & Field events), Basket Ball, & Volley Ball: SAI Coaches, NIS/ B. P. Ed/ M. P. Ed/ Diploma or Participation at National/ State level with good track records. Counselor: BA/BSc(Psychology) with Certificate of Diploma in counseling. Doctor: Minimum MBBS & registered with MCI/ State Medical Council. Venue : Kendriya Vidyalaya No. 1, Sector-30, Gandhinagar. PRT / TGT / PGT : 03-03-2017 at 09:00 a.m.PGT(Computer Science), Computer Instructors / Games Coach / Counselor / Doctor / Nurse: 04-03-2017 at 09:00 a.m.